Brexit: Formula One on the brink? This weekend coming, days before Mrs May drops her bombshell on Brussels, there is an event of far more importance to many of the estimated 420 million fans who will follow it – the 2017 Australian Grand Prix. This will kick off the 68th Formula One World Championship, a motor racing championship for Formula One cars which is recognized by the sport's governing body, the FIA, as the highest class of competition for open-wheel racing cars. Ten teams are scheduled to compete in twenty Grands Prix - starting in Australia on 26 March and ending in Abu Dhabi on 26 November – spending between them just short of $3 billion. And although it is an international sport, with the organising company valued at around $8 billion, all the teams are based in Europe (or have forward bases on the continent) and – making it something of a success story of the UK - seven have bases in England. Between 2005 and 2015 every single world champion (bar one) drove a car which was designed, engineered and built in Britain. The teams themselves employ hundreds of skilled workers and indirectly employ thousands more in an estimated 4,500 related businesses, creating high value engineering and technology spin-offs, with many applications. They support a cluster of high-performance engineering firms concentrated in an area of the Midlands and outer south east - nicknamed "Motorsport Valley"'. These have enjoyed sustained growth since 2009 and achieved an all-time high annual turnover of £9 billion in 2012, employing 41,000 people in the supply of world-class engineering products and motorsport services. In March 2019, just before the UK leaves the EU, one assumes that the Australian Grand Prix may just have bee completed, and 70th season will be under way. But whether the majority of the teams will still be based in England is anyone's guess. Possibly, it will be so destabilised by Brexit that the teams will be forced to move out of the UK in order to stay within the EU. That's the thing about Brexit. In evaluating its impact, it's easy to make generalisations and draw from them conclusions which seem to have merit. But this is about the EU, and the EU is about detail. In terms of industry and commerce, some sectors may do well out of Brexit and others may be permanently damaged. But that's a generalisation. Some businesses within damaged sectors may survive and even prosper. Some businesses will suffer, even though their sectors will escape largely unscathed. For other sectors and businesses, there's no way of knowing. There are too many imponderables. They may do well. They may struggle. They may collapse. It all depends on what happens during the negotiations. As regards Formula One racing, it takes little imagination to pinpoint the areas of vulnerability, identified in this article. It describes "a week from hell" in the 2016 season, as the logistic teams faced the "back-to-back" schedule of Austrian Grand Prix followed by British Grand Prix. These back-to-backs are nothing new in Formula One, we are told, but this one was described as a "killer" because of the distance involved, almost 1,000 miles, and the very fine margins on time as a result. Any delays crossing the Channel, it was feared, could have had a knock-on effect on the British Grand Prix. The logistics of the business are quite remarkable, involving a fleet of six Boeing 747 freighters, with a total load capacity of 720 metric tons operated by logistic partners DHL for the long-distance "fly-aways". They are backed up by 35 containers sent by sea months in advance with the heavy and bulky items. For the European venues, though, the trucks take over, each team operating its own liveried fleet. And in the most challenging transfer, from Austria to the UK venue in Silverstone, there is no margin for error for the 300 or so HGVs, which make up the F1 convoy, heading for Calais and the Channel ferry crossing. In the narrative describing the transfer, concern is expressed about delays at Calais. These has been experienced through the migrant crisis, with every hour lost felt at the other end. There are no contingencies in the even of French unions striking, which has happened a lot recently with air traffic control and railways in the country, nor for French customs to introduce any delays to the system. Last year, Formula One was collectively holding its breath for the trucks appear safely on the other side of the Channel in time for the Silverstone build to begin. That time, they were lucky. In 2019, however, there will be another complication – the UK will no longer be in the Single Market. Irrespective of what deal we manage to bring home from Brussels, there will be border controls at the ports, with customs and other checks. There will doubtless be delays, which will put the tightly organised - and highly fragile - timetables at risk. Additionally, because free movement of goods will no longer apply, the UK-based teams will no longer be able to move their vehicles and equipment freely across the Channel. For customs purposes, they will be treated as temporary imports, for which special rules apply. Fortunately, there is an international system for dealing with such contingencies, implementing the Istanbul Convention on Temporary Admission via the World Customs Organisation. This is the ATA Carnet system, for the equipment, and the CPD Carnet for the vehicles. These allow for the temporary import into the EU – and to other countries in which Formula One events are held. However, they add costs to the system and, of more concern, time. The European circuits are under much greater time pressure than the "fly-aways", with their "back-to-back " events, and much more equipment is moved, including the prestigious team " motorhomes ", each requiring eight or more trucks to move them. 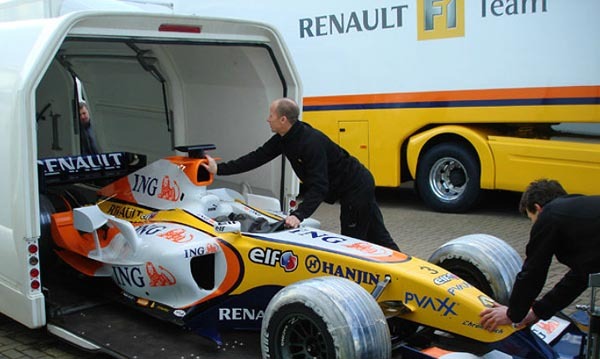 Each Formula 1 team transports roughly 50-60 tons of equipment per race. The teams are completely self-sufficient – they bring their own water bottles, refrigerators, cabling and even their own power generators and their food supplies in refrigerated vehicles. For an ATA Carnet, every item must be listed on the official form and, while a single carnet is valid for a year, once completed, they cannot be changed. But loads vary so much between races that new applications are often needed every time convoys take to the road. And, there's the rub. While loading goes on almost to the minute of departure – not a problem in the Single Market – applications for Carnets must be lodged 2-3 days before travel. Nor does the Carnet remove the need for customs formalities set out in the Commission Implementation Regulation. These include documentation checks and verification inspections, to ensure than all equipment is listed, and checks when they leave the country to make sure the carnet-holders take out everything they brought in. Such checks cannot avoid adding delays to the transport process which, currently, enjoys free movement without customs control. Once the material has been allowed to enter under the temporary admission procedures, bizarre "red tape" provisions apply. For instance, once imported it must be re-exported within a variable time frame (down to three months in some circumstances). That is not a problem for Formula One, running events lasting only days, except that nothing imported can be disposed of locally, without giving five day's notice and getting written permission. Then, specifically, import of "consumables" is not permitted under the carnet system, while imports under the normal import system would require most foodstuffs to be routed via a Border Inspection Post. This effectively means that the lavish hospitality services supplied at EU venues, including the provision of gourmet meals for VIPs cooked in central kitchens, can no longer be serviced from a UK base after Brexit. The point at which the cumulative loss of flexibility makes it more attractive, and even necessary, to move operations away from the UK will obviously be influenced by commercial factors, but if there are added complications, such as requiring visas and work permits for skilled personnel, tariffs on imported components, and onerous rules of origin, the balance of advantage will shift. In a highly competitive and extremely mobile industry, French, Italian, German and Spanish enterprises would be keen to take the business. And with the whole of Formula One built on mobility, it could pack its bags and be gone in a weekend. The killer is likely to be customs delays – at their greatest if the UK opts for the "no deal" scenario and decides to work exclusively under WTO rules. Yet, despite this, we see the build-up of an insidious campaign to convince the public that this option would be acceptable. The idea of us working to "WTO rules" is becoming locked into Whitehall as an unswerving mantra, driving out sentient thought. Rarely, if ever, are the full consequences fully spelt out – and we see Tory MPs such as Marcus Fysh clearly demonstrate that they have no idea what is involved. Yet thinking has never been their strong suit - theirs is the churn out the mantra. Formula One, though, is clearly vulnerable and on several counts. Mobility is the lifeblood of an industry which is dedicated to speed. Any loss of mobility or flexibility in operations would be terminal. And as the backbone of a £9 billion UK industry, its relocation could cost us dear. And it is only one of many industries at risk to the ideologues who form the "Ultra" tendency in Brexit politics. Even with a comprehensive free trade agreement – if it is actually possible to conclude one in the time – we are going to find trading with our EU former partners much more difficult. With the WTO option, it will be inestimably more difficult – little short of economic suicide. These people would have us leaping over the cliff-edge with a song on our lips, singing their praises as our bodies thud onto the rocks below. Those who promote this course of action are going to have a lot of explaining to do when high value jobs and industries up-anchor and move out. The billions will soon add up and, collectively, under the aegis of the WTO option, they will spell out not a recession but a full-blown depression. And that, as they say in the business, is a racing certainty.